Post-secondary institutions across North America have noticed a concerning trend in terms of increased student mental health crises on campuses.Consequently, many colleges and universities have been working to develop responsive and comprehensive mental health frameworks. While broad studies have illuminated the high rates of student mental health struggles, none have focused solely on documenting mental health related crises that occur on campus during a prolonged period of time.This type of information is vital if we are to create comprehensive mental health frameworks for our post-secondary institutions, because it will be these types of incidents that will most vigorously test the policies and processes that comprise the bases of these frameworks.Thus, the current study examined documented student mental health crises on a college campus over a three-year period.The data examined provide an overview of: the types of crises reported (e.g., suicide/homicide risk; psychotic-like behaviour; assault; self-harm); identified triggering events; and the types of internal and external campus supports activated. According to the Mental Health Commission of Canada (2013), by age 40 years of age, 50% of Canadians will have, or will have had, a mental illness. Further, it has been determined that half of all lifetime cases of diagnosable mental illness start by 14 years of age, and 75% by 24 years of age (Kessler, Berglund, Demler, Jin, Merikangas, & Walters, 2005).In Canada, suicide is the second leading cause of death among 15 to 24 year olds, and accounts for almost 25% of deaths among this population (Statistics Canada, 2017).Thus, as a result of the vulnerability of this age group, postsecondary student populations are at heightened risk for emergent or ongoing mental health issues, which in the worst case scenarios can result in suicide. Recent studies have drawn attention to the high rate of mental health struggles experienced by students in post-secondary settings across North America.When Directors of Canadian post-secondary counselling centres were surveyed regarding client trends, 77% indicated they believed that the number of students who presented with severe psychological issues had increased during the past five years and 79% indicated that they believed that the severity of these issues had increased (Crozier & Willihnganz, 2005).Similarly, a national survey of post-secondary counselling directors in the U.S. found that: 94% reported a trend of increasing numbers of students with severe psychological issues; 69% noticed an increase in the number of student “crises requiring immediate response”: and 8% of counselling centre clients were reported to have psychological impairments so severe that they were unable to stay in school, or could only manage to do so with extensive psychological or psychiatric assistance (Gallagher, 2015). This context of increasing psychological distress among postsecondary students has been the backdrop for research in recent years that looks at the impact of student mental health on academic success and retention.Student emotional health has been found to be directly related to academic performance and retention. (Gerdes & Mallinckrodt, 1994; Pritchard, & Wilson, 2003; Van Brunt, 2008). It has further been found that students with mental health issues and disabilities are at greater risk for non-completion of their studies (O’Keeffe, 2013). In addition to the personal, social, and familial costs, when students are unable to complete their post-secondary program and achieve their academic credentials, there are a multitude of costs to the institution and taxpayers (Grayson & Grayson, 2003). The need for a comprehensive mental health strategy within post-secondary institutions has become essential. The Canadian Association of College and University Student Services (CACUSS, 2013) in collaboration with the Canadian Mental Health Association (CMHA) has identified seven key components in developing a systemic framework to support “mental well-being and learning”. (See Figure 1). 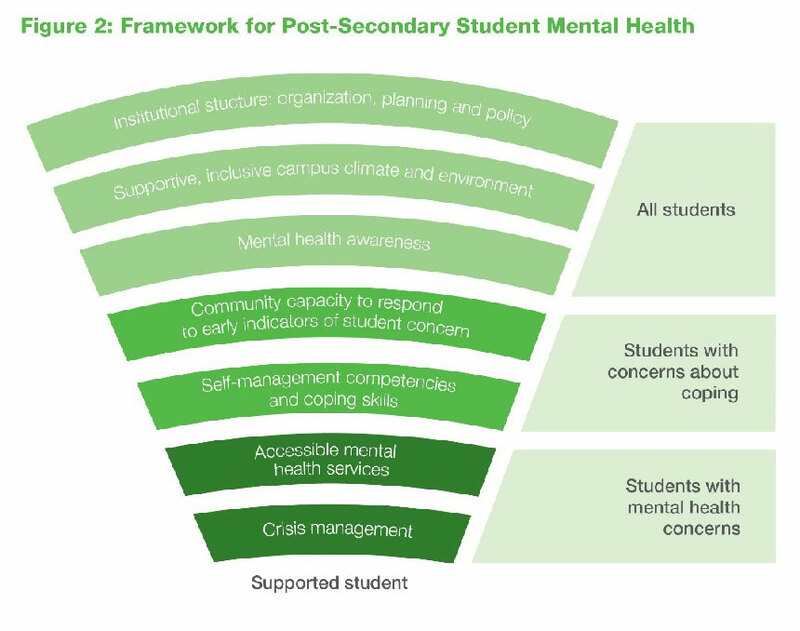 This model proposes that how a post-secondary institution is set up - including its organizational structures, priorities, policies and procedures - needs to be done in such a way as to support student mental health at the broader campus community level, all the way down to the individual level.Given this context, it is reasonable to assume that the effectiveness of a post-secondary mental health framework will be most rigorously tested at the individual student level – when dealing with students who are experiencing serious mental health crises.It is in addressing these scenarios in particular, that campus responders will be looking to the institution for direction. The creation of these institutional frameworks, need to take into account the type of student crises that responders are likely to face. Unfortunately, there is little data available on this.Typically, the details of student mental health crises are known only to those directly involved in responding - which is appropriate given individual rights to confidentiality and privacy. However, without an understanding of the aggregate characteristics of the types of student mental health crises that are occurring on campus, what the response has been, and awareness of potential gaps in these responses, those involved with developing institutional mental health frameworks are doing so without the benefit of actual data. Hence, the current study focused on student mental health crises, documented over a 3-year period, at a large community college.The purpose of this study was threefold: 1) to raise awareness of high-risk student mental health crises occurring on campus; 2) to better understand the nature of these crises and how they are being responded to; and 3) to document this information in an attempt to better inform the development of comprehensive mental health frameworks in post-secondary settings. This study involved the coding of 311 mental health-related student crisis incidents at a large Ontario community college campus, over a period of three academic years (2013-2016). (If a particular incident, on a given day, was reported in more than one incident report, it was still only counted as a single incident). This study received approval from the college’s Research Ethics Board. Four sources of incident reports were utilized:176 Suicide Risk Assessments (SRAs); 90 Residence Incident reports (RIRs) flagged as mental health-related; 37 Mental Health Apprehension reports (MHAs); and 35 Code of Conduct Decision reports (CCDs) that had been flagged as mental health-related. SRAs completed by college counsellors were accessed via the electronic counselling database. This database also provided student demographic information and indicated whether these students were registered with Accessibility Services as having documented disabilities (i.e., learning, medical, psychiatric, mobility, etc.). Residence management provided Residence Incident Reports flagged as related to student mental health crises. Campus security provided reports on incidents in which students on campus were apprehended by Special Constables under the Mental Health Act, (R.S.O, 1990, c. M.7) in situations where police believed a person was suffering from a mental disorder and had threatened or appeared likely to act in such a way as to cause serious bodily harm to themselves or others, or was unable to care for themselves (as per section 17 of the Act). The Code of Conduct Coordinator at the college provided CCD reports that had been flagged to be related to mental health issues.Code of Conduct violations were issued in situations in which students acted in ways that were alleged to have violated sections of the Student Code of Conduct.In these cases, students were required to attend a meeting with the Code of Conduct Coordinator, who would conduct an investigation into the alleged violation, hear the student’s defense, and render a decision, which might include disciplinary sanctions. Each student identified in these reports was assigned a subject number. No identifying subject information was included in data files or data analysis reports, and all results are reported in aggregate form only. Two-hundred thirty-one individual students were involved in 311 documented mental health crises that occurred during the three-year time period studied. Of these students, 131 (56.7%) were identified as female, and 100 (43.3%) as male. (M = 20.75 years, age range = 17-55 years, SD = 4.49).One hundred fifty-six (50.2%) of these students were registered with Accessibility Services at the college, meaning they had provided documentation from a regulated health professional confirming that they had a disability.Psychiatric disabilities were indicated for 135 of these students (43.4%).Overall, the number of documented mental health-related crises per student in this study ranged from 1 to 8 (M = 1.35, SD = 1.03). Table 1 provides an overview of the types of crises responded to, and Table 2 provides a summary of the external resources activated by college staff in response to these crises. Table 3 provides a summary of the types of identified triggering events. *Some incidents had more than one descriptor. Of the 176 SRAs coded, 111 (63.1%) involved females and 65 (36.9%) involved males (M= 22.13 years, age range = 17-43 years, SD = 3.87).Of these students, 88 (50%), were registered with Accessibility Services as having a disability, and of these, 82 (46.6%) were identified as having a psychiatric disability.The average number of SRAs per year was 58.7, which means that on average, an assessment was completed approximately once per week. On a scale of 1 to 10 (with 10 being the highest or most intense), a mean of 5.10 (SD = 2.82, and range = 0-10) was reported for intensity of current suicidal ideation.Regarding current intent to act on suicidal thoughts, the mean was 4.40 (SD = 3.07, and range = 0-10).The mean response to the question “how bad does it get”, was of 8.70 (SD = 1.76, range of 1-10), with 74 respondents (42%) indicating it reached a 10/10.Current intensity of suicidal ideation was significantly related to intention of acting (r = 0.57, p =.001). Independent samples t-tests were used to compare students who indicated they had social support, with those who did not, on SRA measures.Significant differences in current intensity of suicidal ideation were found (t (168) = 2.41, p=.05), between those students who indicated they had supportive people in their lives (M=4.68, SD = 2.69), and those who said they did not (M= 5.71, SD = 2.86).There were also significant differences between the groups in terms of how bad their suicidal ideation gets (t (163) = 2.06, p = .05) in that those with social support indicated overall lower intensity of ideation (M= 8.45, SD = 1.81) than those without (M= 9.01, SD = 1.66. There were no significant differences between genders on any of these measures. Students with documented disabilities were significantly more likely to have a current suicide plan (M = .80, SD = .40, and t (164) = -3.64, p = .001) and the means available to act on that plan (M = .80, SD = .40, and t (163) = -5.34, p = .001) in comparison to students who did not identify as having a disability (M = .55, SD = .50, and M = .43, SD = .50 respectively). Counsellor perception of risk had a mean of 5.01 (SD = 2.75), with a range of 0-10, and there were 49 cases (27.8%) in which counsellor perception of risk was between 7 and 10. Table 4 summarizes information obtained through SRAs, which describe important clinical information to help counsellors to assess the degree of risk, while Table 5 summarizes interventions activated. Mental Health Apprehensions occurred in 6 (3.4%) of these incidents, Residence Incidence Reports were completed for 3 (1.7%) of these incidents, and 2 (1.1%) of these incidents resulted in a Code of Conduct Decision. Of the 90 RIRs, 54 (60.0%) involved females and 36 (40.0%) males (M = 18.96 years, age range = 17-23 years, SD = 1.58). Fifty-two (57.8%) of these students were registered with Accessibility Services, and of these, 43 (47.8%) were identified as having a psychiatric disability. Table 6 breaks down incident descriptors for RIRs. Mental Health Apprehensions occurred in 7 (7.8%) of these incidents, Suicide Risk Assessments were completed for 2 (2.2%) of these cases, and 7 (7.8%) resulted in a Code of Conduct Decision. Just over half of the 37 incidents in which students were apprehended under authority of the Mental Health Act, involved females (n = 19, 54.3 %), while 16 (45.7%) involved males.These students ranged in age from 17 to 35 years (M = 20.03, SD = 3.02). Nineteen (54.3%) were registered with Accessibility Services, and of these 17 (48.6%) were coded as having a psychiatric disability. Table 7 summarizes the types of behaviours involved in the cases in which a MHA occurred. Suicide Risk Assessments were completed for 6 (16.2%) of these incidents, Residence Incident Reports for 7 (19.0%), and 5 (14.3%) of these cases resulted in a Code of Conduct Decision. Of the 35 CCD incidents flagged as being related to mental health issues, 19 (54.3%) involved females and 16 (45.7%) involved males (M= 20.03 years, age range = 17-35 years, SD = 3.02). Nineteen (54.3%) of these students were registered with Accessibility Services, and of these, 17 (48.6%) were identified as having a disability that was psychiatric in nature. Table 8 contains an overview of crises descriptors for these incidents. Mental Health Apprehensions occurred for 5 (14.3%) of these incidents, Residence Incident Reports were documented for 7 (20%) of these cases, Suicide Risk Assessments had been completed for 2 (5.7%). The number of documented mental health crises events that occurred during the 3-year period studied averaged 2.0 events per week. Specifically, SRAs were documented on average once per week, or 58.7 times per year, which is higher than the average of 34.4 SRAs per year documented at the same college over a five-year period from 2004-2009 (Porter, 2010).These numbers underscore the fact that these crisis events are by no means rare. Almost half of all of these documented mental health crises involved students who had identified with the college as having a documented disability – the vast majority of whom had indicated a disability that was psychiatric in nature.This contrasts with the fact that students with documented disabilities only make up approximately 10% of this college’s student population. This overrepresentation of students with disabilities in high-risk mental health incidents during this time-period would seem to underscore the increased vulnerability of this population, and the potential need for additional proactive supports. The majority of these incidents involved perceived risk to the student him/herself.More than three-quarters of these events were linked to the risk of suicide, while other perceived risks to the individual’s well-being included self-injury, or behaviours that appeared to be related to potential psychosis (e.g., hearing voices instructing one to harm oneself or others, speaking of other living entities within one’s body).Of special concern, there were 18 incidents, in which students had attempted suicide in the hours or moments prior to the crisis intervention.A minority of these incidents involved potential/actual harm to others – including uttering threats, physical assault, and/or homicidal ideation. While there were no identifiable triggering events in almost half of these crises incidents, relational conflict, or loss (i.e., through death or suicide), were identified as triggering events in a third of these crises. Other identified triggers (in decreasing order) included: academic stress, mental illness, sexual assault, and college adjustment issues.These results support those found by Drum, Brownson, Denmark & Smith (2009), in which relationship issues and academic issues were found to have a large impact on suicidal ideation.Additionally, these researchers noted that “wanting relief from emotional or physical pain” was the strongest contributor to this ideation and further, that “systems that become involved with academically distressed students may have an opportunity to interact with these students in a way that is sensitive to and may decrease their likelihood of developing suicidal thinking” (p.217).Consequently, these authors suggest that it is imperative that post-secondary institutions take seriously the potential impact of relationship conflicts and academic issues on students, and utilize a problem-centred paradigm to involve the entire campus community in taking steps to address student suicidality. The most frequently utilized crisis incident reports during this time were SRAs.The risk of suicide among students, for whom SRAs were completed, was quite serious as evidenced by the following observations:the average student response (out of ten) to the question, “How bad does it get?” was 8.70;60% of students reported a past suicide attempt; 67% had a current suicide plan; and 60% had immediate access to the means to act on their suicide plan.Research has demonstrated that the most consistent predictor for future suicide attempts and/or completed suicide is having attempted previously (Joiner, Conwell, Fitzpatrick, Witte, Schmidt, Berlim, Fleck, & Rudd, 2005; Schwartz, 2006). Lack of social support was also identified as a risk factor, which is consistent with previous findings (Arria, O’Grady, Caldeira, Vincent, Wilcox, & Wish, 2009). Furthermore, students with documented disabilities appeared to be an especially vulnerable subgroup in that they were significantly more likely to have a current suicide plan and to have immediate access to the means to act on their suicide plan, in comparison to their peers who did not have a documented disability. voluntary and involuntary leave policies. Development of a formal transition strategy for students with existing mental health issues who are entering the college – with an emphasis on prevention and setting up early warning mechanisms. Identification of On-Campus Student Services and the roles they play in the identification and support of students who are dealing with mental health issues.This could include ensuring that there is an on-campus health/medical services model that can be responsive to mental health crises in a timely manner, so that the need for medical intervention can be initially addressed on-campus, rather than having to transport students to hospital. Development of an Education and Training Strategy to promote faculty/staff/student knowledge, awareness and skills regarding student mental health issues, appropriate ways to respond, and available supports. Revisiting student confidentiality and privacy policies with respect to situations in which safety becomes an issue, to determine a process for how and when information will be shared between counselling, health services, residence and/or campus security. Developing formal notification procedures between areas such as security, residence and counselling.Given that 50% or more of the students involved in the documented crises incidents during this time-period were registered with the counselling office as having a disability, it would make sense that the counselling office be notified of all of these incidents, which would then allow for counselling follow up with these at-risk students. Exploring the use of additional supports for students who have identified as having a disability that is psychiatric in nature, given the apparent increased vulnerability of this group.For example, as part of their supports, these students could be offered a mid-semester check-in with a counsellor to address any personal or academic concerns they are dealing with. This study represents the first of its kind to examine documented mental health crises in a post-secondary setting, over a prolonged period of time.While these results are limited by the fact that only one post-secondary setting served as the source of this data, there is no reason to think that this is not a valid snapshot of some of the types of crises that are occurring in post-secondary settings across the country.These descriptions are in line with the increased number and severity/complexity of student mental health issues reported by counselling centre directors during the past decade.The results underscore the importance of creating and maintaining an inclusive post-secondary environment in which all institutional policies and procedures are assessed through a lens of mental health.It is only in such an environment that all students will have an opportunity to experience a sense of belonging, and feel supported as they address the mental health issues that we know are likely to arise for a significant portion of this population during their time with us. Arria, A. M., O’Grady, K. E., Caldeira, K. M., Vincent, K, B., Wilcox, H. C., & Wish, E. D. (2009). Suicide ideation among college students: A multivariate analysis. Archives of Suicide Research, 13(3), 230-246. Crozier, S. & Willihnganz, N. (2005). Canadian Counselling Centre Survey. Calgary, Alberta: CUCCA. Drum, D. J., Brownson, C., Denmark, A. B., & Smith, S. E. (2009). New data on the nature of suicidal crises in college students: Shifting the paradigm. Professional Psychology: Research and Practice, 40(3), 213-222. Gerdes, H., & Mallinckrodt, B. (1994). Emotional, social, and academic adjustment of college students: A longitudinal study of retention. Journal of Counseling and Development, 72(3), 281-288. Joiner, T.E., Conwell, Y., Fitzpatrick, K. K., Witte, T. K., Schmidt, N. B., Fleck, M. P., & Rudd, M.D. (2005). Four studies on how past and current suicidality relate even when “everything but the kitchen sink “is covaried. Journal of Abnormal Psychology, 114(2), 291-303. Kessler, R. C., Berglund, R., Demler, O., Jin, R., Merikangas, K. R., & Walters, E. E. (2005). Lifetime prevalence of age-of-onset distributions of DSM-IV disorders in the National Comorbidity Survey Replication. Archives of General Psychiatry, 62(6), 593-602. Mental Health Commission of Canada (2013). Making the case for investing in mental health in Canada. O’Keeffe, P. (2013). A sense of belonging: Improving student retention. College Student Journal, 47(4), 605-613. Olding, M. & Yip, A. (2014). Policy approaches to post-secondary student mental health. OCAD University & Ryerson University Campus Mental Health Partnership Project. Toronto, ON. Pritchard, M. E., & Wilson, G. S. (2003). Using emotional and social factors to predict student success. Journal of College Student Development, 44(1). 18-28. Schwartz, A. J. (2006). College student suicide in the United States: 1990-1991 through 2003-2004. Journal of American College Health, 54(6), 341-352. Van Brunt, B. (2008). Retention and college counseling centers. Recruitment & Retention in Higher Education, 22(5), 1-3. Xiao, H., Carney, D. M, Youn, S. J., Janis, R. A., Castonguay, L. G., Hayes, J. A., & Locke, B. D. (2017). Are we in a crisis? National mental health and treatment trends in college counseling centers. Psychological Services, 14(4), 407-415. Shirley Porter is a registered psychotherapist and social worker. She currently works full-time in the Counselling Department at Fanshawe College and is an Adjunct Clinical Professor at Western University.